Today I proudly debut the new web presence for Thomas Ladd Pottery. Please come explore and share in one of my life's passions. Please go to the calendar page to see an updated schedule of events. I am attracted to the intimate human scale of fired clay objects and how they integrate into people's lives. Weathered rock becomes clay, which can be hand formed and transformed in unlimited ways. The potter's kiln turns clay back into rock. Stoneware encapsulates the hand and heart of the potter. Exploring the parameters of material, process, surface, form and space is an endless learning challenge. Complete dedication and a strong technical foundation are necessary to produce works of significance. 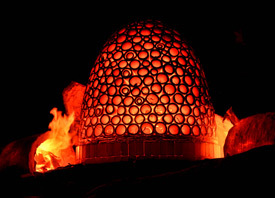 Subjecting my work to the smoky orange white heat of the kiln is a life reinforcing experience. © Thomas Ladd Pottery 2011.